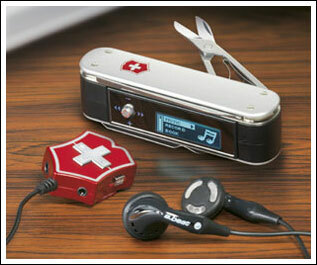 Purists may look down their noses at this new Victorinox “s.beat” MP3 player, incorporated into the traditional Swiss Army Knife. The rest of us will admit that a portable music player will come in handy at least as often as a tiny pair of scissors. The product easily comes apart, too, so you can take the music player through airport security and check the knife in your luggage. This isn’t the first foray into digital for the Swiss Army Knife. A version featuring a USB memory stick has been available for some time. Via Popgadget.